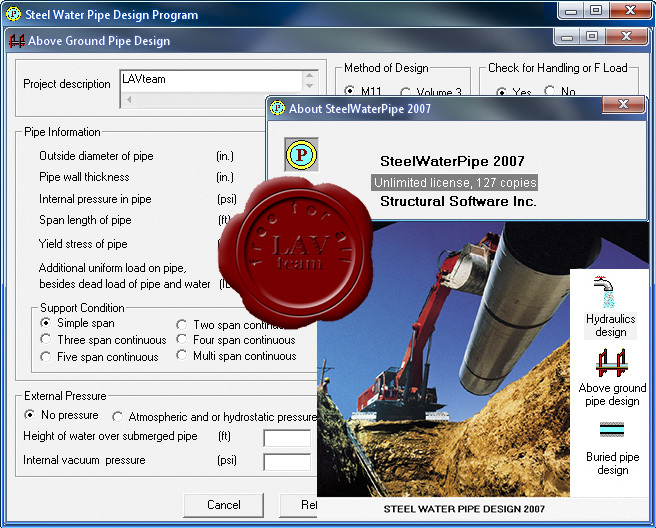 Steel Water Pipe Design Software 2007 is developed to aid structural engineers involved in the design and analysis of steel water pipes. The user-friendly software may be utilized for above ground and buried pipe installation with the option of using the 1989/2004 AWWA M11 or 1996 AISI Welded Steel Pipe (volume 3) design manual. The Software is divided into three main modules and nine secondary modules. Design of above ground pipe installations. Steel properties of different grades of steel. Calculating minimum wall thickness of above ground pipes. Calculating physical properties of pipes. Checking buckling and deflection of buried pipes. Calculating stresses in above ground pipes. Calculating expansion joints distances and widths. Collar, wrapper and crotch plate design. Thrust restraint, anchor rings and joint harnesses design. Calculating circumferential fillet weld size.